I’ve been quietly snaffling twitter timelines using the subtitle generator I created. 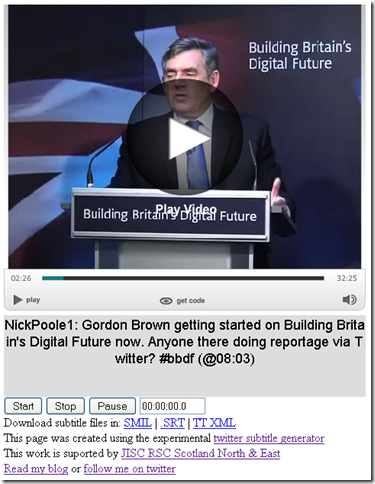 The latest one was prompted by Brian Kelly’s post on the The “Building Britain’s Digital Future” Announcement. In this post he mentioned that twitter was a buzz with the #bbdf hashtag. Update: As well as being ‘Fun, intriguing..‘ Brian Kelly has a nice post on the ‘Issues In Crowd-sourced Twitter Captioning of Videos‘ (which despite the title I read as a positive use of tweets as they are contextualised with an event). Tony (who inspired me to look at this area) and I are both keen to take some of the twitter captioning ideas forward so if any developers or funders want to get involved we’d like to hear from you.